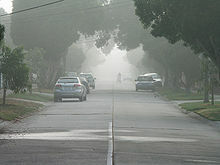 Light fog reducing visibility on a suburban street. The cyclist is very hazy at about २००m (२१९ yards). The limit of visibility is about ४००m (४३७ yards), which is before the end of the street.